The author of this enlightening and extremely informative book writes from a lifetime in business. His vast span of knowledge encompasses the whole spectrum, from starting out, learning the hard way, choosing your market, employing the right sort of people, and the importance of dedication and attention to detail. It is this attention to detail which he emphasises throughout the book, highlighting that it is the little things to one person, which matter so much to someone else. This is a very important message, and this book is littered with examples of good business practice which he has excelled at, or failed in, but through the experience he learnt where he went wrong, and passes the information down to you, the reader. 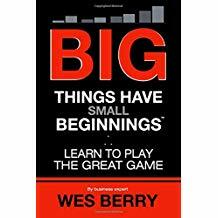 Right from the beginning there is so much to learn from this book, and it is all there just waiting for the hungry would be businessman or woman to ingest. From mapping out your future goals, to meeting deadlines and targets, and the strategies you will need to utilise to achieve them. He looks at what gets you up in the morning, and encourages you to determine what your motivation is, to grasping those dream and making them happen. Gives examples of famous influencers throughout history in many fields, and encourages us to embrace the messages which have become their legacy. There can be no doubt that ‘A Message to Garcia’ by Elbert Hubbard, which is included in the book, has had a deep impact on the author, especially with regard to employing people. Before reading this I admit I had never heard of it, however, once read, it is easy to understand the importance of employing and encouraging employees with the ‘Rowan Trait’ which simply explained is a no-holds-barre commitment to getting a task done. Jam packed with information from cover to cover, this book contains all the motivation, and advice anyone could need to succeed in their chosen business career. Wesley Berry started working at his family’s Detroit-based florist shop when he was a teenager. He quickly demonstrated a strategic style of management that propel it from a $65K per year business to a $65 million-dollar international business operating in 130 different countries. In 2016, after 40 years in business, he sold it to “retire” and follow other passions. Garnering from his years of experience working with radio stations, Wes is currently the host of The People’s Voice, a weekly radio talk show that features both controversial and unifying topics. Through the years, he’s provided consulting services to over forty businesses, served as Headmaster of a state-licensed private vocational school, and worked as a licensed real estate agent, having participated in over thirty commercial transactions. Wes has collaborated on designing sets for both ABC and CBS television shows, has appeared as a guest on several talk shows, and has been interviewed countless times by broadcast and print media. His many media appearances include: NPR, The Wall Street Journal, The London Times, Entrepreneur and Time magazines, Fox News, Neil Cavuto, Geraldo Rivera, and John Stossel, to name a just few. Wes has held memberships in: The Detroit Economic Club, Adcraft Club of Detroit, Rotary International, Optimists International, NAACP, Shriners International, Wabeek Country Club, Detroit Athletic Club, Detroit Gun Club, NRA, and at Kirk in the Hills Presbyterian Church, where he’s taught Sunday School, ushered, and served on its Board of Trustees. He has also served on the boards of an Educational Foundation, Community Youth Assistance, and Henry Ford Hospital. Wes is a Freemason and currently serves as a Trustee of the Michigan Masonic Charitable Foundation. He also volunteers with a community group that provides wheelchair ramps to those in need. He’s a graduate of Oakland Technical Center, having completed their Floriculture & Agriscience Program. A dog lover, Wes enjoys fishing, and is constantly humbled by his golf game. He and his wife Mia have four sons and have been married for thirty years. They reside in Michigan. Wes Berry built a remarkable $60 million-dollar international business from his family’s small florist shop, which began in Detroit. Now, in his extraordinary new book, he shares what he has learned over the years about leadership and business growth. It is his belief that, to play in the Great Game, you must accept that winning and losing are both part of the same experience. Gleaning from his personal endeavors in business, Wes instructs and encourages you to take full responsibility as a leader. Drawing on insights from great leaders throughout history, he guides you in learning to do the key tasks that made them successful—tasks that will enable you to find complementary employees and associates whom you can help develop in the very same way. With each turn of the page, you’ll gain knowledge from strategists such as Sun Tzu, General Douglas MacArthur and Sam Houston that will help you grow in business as well as life. Everyone has to start somewhere. As Wes himself has learned, those Small Beginnings often inexorably lead to some mighty Big Things!